Haomei is one of the top aluminum sheet 5052h32 manufacturers in China, we can supply aluminum sheet with thickness 0.2mm to 150mm with fast delivery. 5052 aluminum alloy is the most representative alloy with medium strength. It has good corrosion resistance, weldability and formability, especially high fatigue strength and good seawater resistance. The general application of aluminum sheet 5052 h32 are ship, vehicle, construction, bottle cap, honeycomb plate. 5052 H32 aluminum sheet is a commonly used aluminum-magnesium sheet alloy, it is formed by hot-processing and belongs to hot-rolled aluminum sheet. According to different production processes, it is generally produced by 1-2 times cold rolling and annealing after hot rolling of hot rolling mill. Aluminum sheet 5052 h32 is soft and can be bent 90 degrees, stamped and shallow stretched. The national standard of 5052-H32 alloy aluminum sheet the magnesium content is about 4%. The H32 state indicates that the aluminum sheet is heat-treated and stabilized by low-temperature annealing after work hardening. 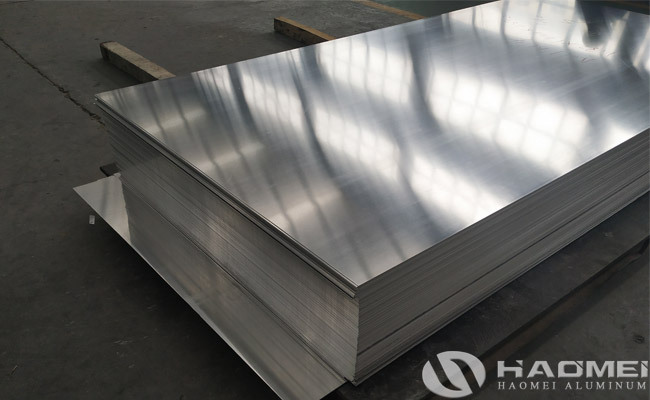 The 5032 aluminum sheet in the H32 state has many specifications, both thin sheet and thick plate. Aluminum sheet 5052h32 manufacturers can produce aluminum sheet with customized specification for applied in many industries like automotive aluminum alloy, 3C products, computer brackets, high-end curtain wall panels, high-end oxidizing materials, cans, lids, shutters, trolleys, aluminum furniture, door panels / door handles, signs, decoration, silo, flange material, GIS shell, yacht, underwear mold / shoe mold, gas storage cylinder, precision machining, etc. The usage of 5052-h32 aluminum sheet in automotive aluminum field are automobile engine outer board, bus car trunk board, bus anti-skid decorative board, aluminum fuel tank for automobile fuel tank, etc.